This seemed to me as remote a spot as any I had found in Suffolk, and you would not think that we are barely three miles from either Saxmundham or Leiston. The church stands about a mile west of the village of Coldfair Green, which is home to the great majority of the parish's inhabitants, and the first time I ever came here, in the 1990s, I had found it up a sodden, muddy lane. Just beyond the church, the lane was flooded, but the church was set slightly above the road, in a characterful graveyard. Its only company was an old farmhouse across the way. 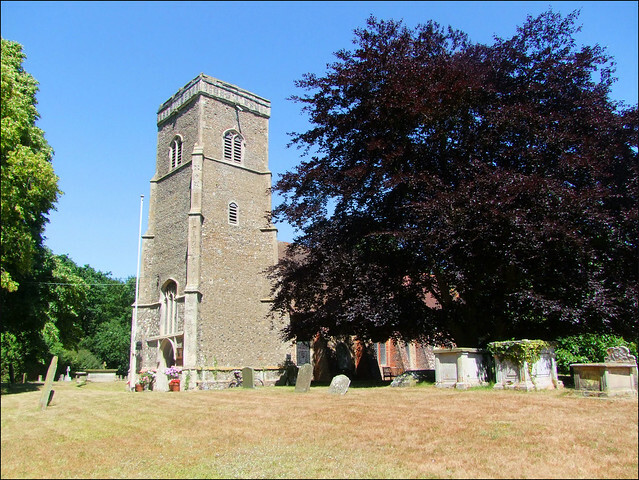 The situation is as remote today, but when I returned it was on one of the hottest, driest days of the year, and the magnificent copper beech and walnut trees to the south of the church were in full leaf. The churchyard was still verdant, the haze of heat shimmering across it. Sam Mortlock remembers the sound of the stream below rising up through the woods, and in the 1930s Arthur Mee was entranced by a nightingale in the churchyard. I am afraid that any nightingale today would have had to compete with the sound of Heart-FM from the garden of the house, but this did not spoil the mood too much. This was still a lovely spot, and I again felt an immediate fondness for it. There are several suggestions that this building is basically Norman at heart, not least the blocked door to the north. Early 19th century buttresses rather disrupt the south wall, but the array of windows between them are charming. There is a fine 15th century tower, with headstops grinning into the west door. North and south doors are both now blocked, and you enter through the west door into the area beneath the tower. The sign on the inner door said Please keep this door shut to keep the heat in! which was amusing on this day when the temperture outside was touching the high eighties. As it was, I stepped down into the coolest space I had entered all day. There is a striking sense of the very late 19th and early 20th Centuries here, that brief period during which the Church of England in general, and the High Church movement in particular, reached the zenith of its influence and power before the slow falling away in the decades after the First World War. Symptomatic of the triumphalism of those times are two windows. The one in the south side is of the risen Christ, which is signed by the Arts and Crafts Movement firm W.B Simpson & Sons. It dates from 1910, and I think it is their only work in Suffolk. To the east is the 1930s glass by the A.K. Nicholson Studios, showing Saint Lawrence and the Blessed Virgin flanking Christ the King, thus revealing something of the churchmanship of St Lawrence at the time. It is interesting to see their rather grave style of that decade, without the airiness which would enter the workshop's work after the Second World War. A beautiful Art Nouveau candelabra hangs from the chancel roof, and the feeling of the period is further enhanced by two memorials which are in copper rather than brass, perhaps the work of a local artisan. The font is a fine example of the type mass-produced from Purbeck marble towards the end of the 13th century, of which several survive in this area. it is set on a collonade and a matching modern octagonal base. The screen fencing off the belfry platform was probably part of the roodscreen. A coat of arms perches rather awkwardly on top; it would perhaps once have hung from the ceiling at the point where it becomes the scissor-braced roof of the chancel. Further east, behind the pulpit, are a pair of brasses up on the chancel wall. They show John and Margaret Jenney, who paid for the building of the tower, and they were presumably reset here at the time of the 19th century restoration. It's always a pity not to find these things still in situ on the stone floor, not least because if there is ever a fire here the Jenneys will run down the wall like melted butter. The most famous possession of the church was the painting The meeting of Jacob and Rachel by William Dyce, the great early pre-Raphelite. It was donated to St Lawrence in 1948, but the picture hanging above the pulpit now is a life-size photograph of it, because the parish sold the original in the 1980s to pay for essential repairs. This seemed to me an eminently sensible thing to do, although it did occur to me that I might not be leaving any of my extensive art collection to the parish of Knodishall now.